Would Republicans Consider It Unconstitutional For Federal Government To Destroy Asteroids Headed For The Earth? This story in The Onion raises a real point. Would Republicans consider it to be unconstitutional for the federal government to destroy an asteroid hurling towards the earth because this is not a function of government mentioned in the Constitution? Would they insist upon leaving this to be handled by states, or claim that destruction of asteroids would be handled better by the market? “We believe that the decisions of how to deal with the massive asteroid are best left to the individual,” King added. No, its not because Beck has gone off his meds. Many people have suggested that since the crisis in Egypt began Fox News’ Glenn Beck sounds crazier than usual. This is a hard assessment to quantify. But if it is true, the uptick in craziness may be attributable to the decline in Beck’s audience. The Bay State’s senior senator is running an unofficial campaign to become the next secretary of state. For once, he looks artful, as well as ambitious. His recent opinion piece in the New York Times said what President Obama couldn’t or wouldn’t: Mubarak must go. 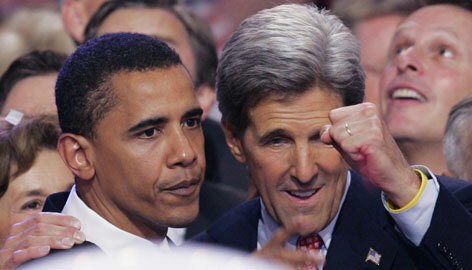 Secretary of state is the spot Kerry wanted when Barack Obama won the presidency. He lost out to Hillary Clinton and Obama’s “team of rivals.’’ But his fallback position as chairman of the Senate Foreign Relations Committee provides a powerful platform to press his case. At times Kerry has already been considered the de facto Secretary of State. Kerry was the obvious choice for the position when Obama took office but other priorities took precedence. At the time it was more important to get Hillary Clinton out of the Senate where she might have established a conflicting power base, as well as to keep her out of health care policy. With that accomplished, there is no reason to consider anyone else for the position should Hillary Clinton to decide she does not want to remain at the State Department in a second Obama term.